about indonesia: Indonesian Green Ganyon "Cukang Teneuh"
So far, we would often hear about the exotic sights of the Grand Canyon is located in northern Arizona, USA. Grand Canyon is a natural phenomenon that shaped cliff and crag, and flown by the Colorado River. For those of you who harbored a strong desire to visit these places but are constrained by cost, you do not be disappointed. One thing you need to know that Indonesia also have similar attractions. In the area of West Java, there is a flow of the river flanked by towering cliffs that create very exotic scenery and almost exactly with the views of the Grand Canyon of America. Hence, the natural charm on the ground Pasundan was named the Green Canyon. At first, these exotic sights named Cukang Taneuh which means "land bridge". That's because the upstream flow Cijulang River there is a wide land bridge with a length of 3 meters and 40 meters. The bridge connects the village of Desa Batukaras Kertayasa and separated by high cliffs that form a tunnel on the rivers. In 1990, two tourists from France and Switzerland who visited Cukang Taneuh very impressed with its natural beauty. They then call it as the Green Canyon. Then in 1993, a French citizen popularizes that name until today. It can be said that the name is a play on the Green Canyon Grand Canyon. That was just to illustrate that both places have in common natural contours. Distinctive is that, if the natural scenery Grand Canyon in America is dominated by brown and red colors, Green Canyon in West Java is dominated by green color. Until now, there are still signs that read Cukang Taneuh close these gate attractions. However, most people are more often called by the name of Green Canyon. 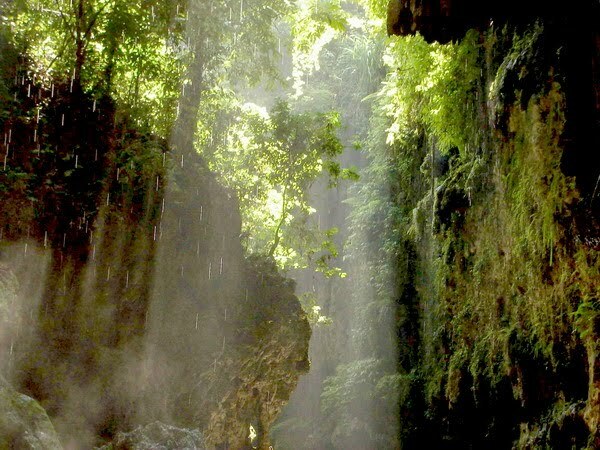 For those of you who want to look for a different sensation tour, visit the Green Canyon is one option that is quite interesting. You will be served with a blend of natural paintings so unique and challenging to navigate. Starting from down Cijulang River flanked by high cliffs, through caves filled with stalactite and stalagmite, swimming, even you also can do dive activity on the river and rock climbing. Soothing eye sight that will greet when you set foot on Pier Ciseureuh. Shortly after doing pengarungan, your eyes will be spoiled with green trees and green Tosca streams. On the side of the river flow Cijulang, there are cliffs and hills are overgrown with trees and rocks. Sound of wind blowing the trees and the occasional sound of birds chirping as you complete the journey. If lucky, you may see lizards due Cijulang River are the habitat of animals like reptiles, the Komodo dragon. Other animals such as snakes and monkeys sacking would often be seen in this place. In addition, by using ketinting Pengarungan River (small boat) you can never forget. After a 20 minute journey, you are presented with views of a pair of sturdy hill. The width of the river will be increasingly narrower and ketinting will increasingly slow. You will arrive at the mouth of Green Canyon Caves with stalactites and stalagmites are unique. The flow of water in the cave is quite heavy, unlike the flow of water during the start pengarungan. Up here, ketinting cannot take you. However, there are two options that you can do, ie get into the cave on foot or traveling home back to the dock. If you decide to come down from ketinting and continue the journey on foot, then the real adventure has just begun. Having set foot on the rocks, the beautiful scenery awaits. Stalagmites and stalactites that decorate the walls of the cave as if lined up to say welcome your presence. Not just leave it at that, if you want to watch more remarkable scenery, you can swim about 10 meters into the cave by using the buoy. There you will find stunning scenery. Relentless rush of water that resembles a heavy rain soaked the cliffs and rock walls. The place is called the region of Eternal Rain, due to the volume of water that never subsided even though in the dry season. 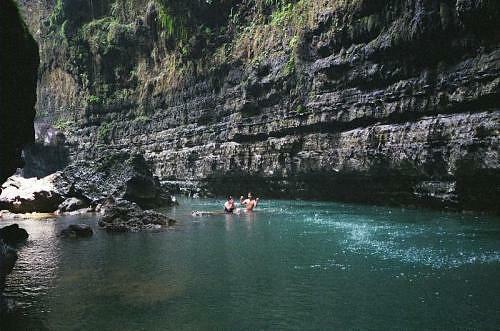 Besides the beautiful scenery above the water surface, the Green Canyon will be a separate heaven for you who like to dive. Stay brought some diving equipment, the spectacular basin-basin in the water ready to be explored and enjoyed, complete with various types of fish that swim to traverse the bottom of the pool. For those who like to do activities that challenge, you can jump from a large rock with a height of 5 meters to the bottom of the deep. 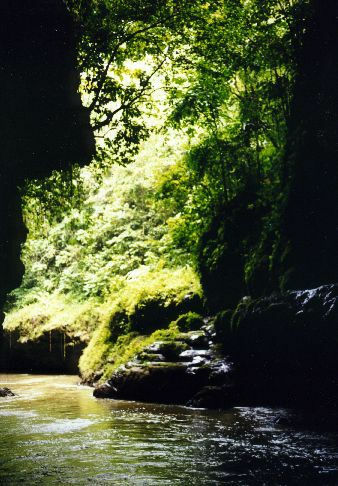 Beside rich with charm, Green Canyon also contains a number of myths. According to stories circulating in the local community, those who wash the face using a splash of water dripping in the cave will stay young, easily able to mate, and launched the rich. Therefore, many tourists who take a bath under the waterfall splashing Palatar existing at the mouth of the cave. Not infrequently they also drank the water splashing. In addition, there are also restrictions should not be made, ie words that are not polite and also the word "crocodile". Once satisfied swimming, diving, and enjoy the charm of Green Canyon, you can return to the mouth of the cave to meet with the owner of a leased ketinting waiting for you to return to the dock. For day trips to the Grand Canyon, we recommend you visit during the dry season or a month from May through September. When the dry season, water is green Cijulang River Tosca and water discharge is suitable to perform pengarungan. While in the rainy season, river water will be brown and the possibility of fast-flowing river will be swift so that the pairs and are feared to endanger safety. 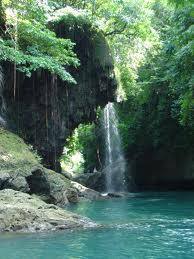 Administratively, the attractions are located in Green Canyon Village Kertayasa, District Cijulang, Ciamis regency, West Java Province, Indonesia. Green Canyon is only about 31 km from Pangandaran beach or around 45 minutes journey. While the district capital of Ciamis is 130 km, and 393 km from Jakarta or approximately 7-8 hours drive inland. When they arrived at Pier Ciseureuh, you must continue the journey along the river or small ship menggunkan Cijulang ketinting. Distance of the pier with the Green Canyon site approximately 3 km and usually takes a short 30-40 minute commute. To be able to shore up the River Cijulang with high cliffs, you can hire a boat with Rp75.000 rate, 00 which can be filled by five passengers. This rate is valid for 45 minutes pengarungan river. If you want to explore further up the river, you must pay the additional cost to the boater whose numbers in accordance with the agreement. For those of you who want to swim down the aisles of unique rocks and feel the sensation of eternal rain or splashes Palatar Waterfall, you can rent a vest that is provided by the crew. For a single buoy Rp5.000 charged, 00 (February 2009). Ciseureuh Wharf is a major facility that has been built in this place. Not only serves as a dock where the ship docked, the place also have mushola playgrounds, parks, public bathrooms, restaurants, and various shops selling souvenirs and food. Because of its location close to attractions Batu Karas, Pangandaran, Citumang River Nature Reserve, and various other attractions, you will not need to worry about lodging a problem because around these attractions there are many hotels and guest house you can rent for the rest.